When I assembled my VGA implementation on my Mojo FPGA, I did so with only a single wire for each of the color signals (Red, Green, and Blue). This limited my color choices to 8 colors. I read about using Pulse width modulation to send other values to a wire, so I gave it a try. The results were interesting, but not what I was looking for. I added three new signals for the PWMs. One PWM per color. Those are defined starting on line 37. Once those were defined, I then set the colors on the objects on the screen (the wall, the ball, the paddle, and the background). That code starts on line 149 (colors are defined in hexadecimal). I then defaulted the color to red for things that didn't have a setting (line 178). On line 187, I set the output of the VGA wires to the most significant bit of the PWM accumulators. The idea was that the PWM would send a different color to the monitor. I really don't know how (or even if) I can fix it, but the results are interesting. After watching the video below, I learned that this is a hardware issue. I need to build out the different resistance values to handle each of the bits with a gpio pin on the FPGA. 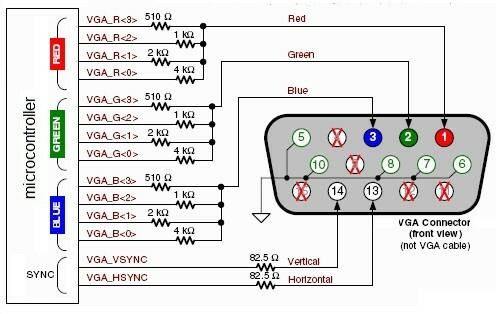 Here is a 12-bit schematic that I'm going to try next.